Spend one memorable week in Italy learning how to cook authentic Italian dishes from Chef Ezio. Each morning start in the kitchen with fresh, local ingredients as everyone works together to create an authentic Italian dish. Then enjoy your hard work as you all sit down for lunch. Your learning will be through kitchen time with Ezio, history of the food, tours of local pasta factories and cheese makers, take trips to the outdoor market, fishing spots, beaches and the best restaurants the area has to offer. Each participant will receive a certificate of course completion, a personalized apron, the skills to cook like a real Italian, and a lifetime of memories. Here you will find tour itineraries, location information, and dates. One week - 8 days and 7 nights all inclusive stay in a private bed and breakfast in Prezza, Italy. Beautiful Prezza is located one hour from Rome in the Province of L'Aquila. 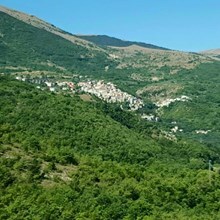 L'Aquila sits upon a hillside in the middle of a narrow valley; tall snow-capped mountains of the Gran Sasso massif flank the town. A maze of narrow streets, lined with Baroque and Renaissance buildings and churches, open onto elegant piazzas.